According to reports, scientists in china claim they have successfully created a ‘working prototype of the impossible, reactionless engine, and say that they have already begun testing it orbit aboard their Tiangong-2 space laboratory. 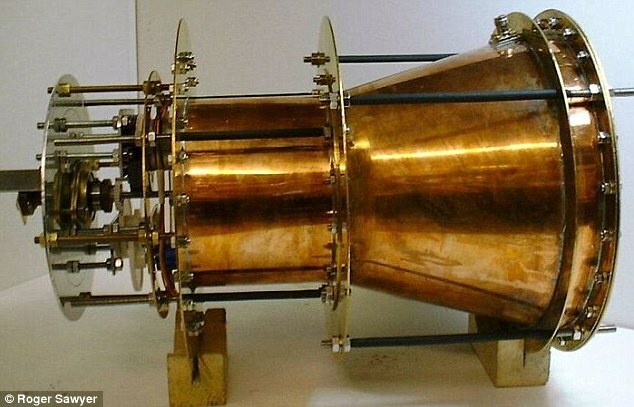 The controversial, radical and revolutionary fuel-free EmDrive has created a buzz in the scientific community after a paper published by scientists at NASA showed the technology works successfully. The physics-defying engine is said to be able to help bring mankind to Mars in just 10 weeks. While experts in the US and Europe debate whether or not the engine works, whether or not it is viable for space, scientists with the Chinese Academy of Space Technology claim NASA’s results have ‘re-confirmed’ what they’d already achieved. Furthermore, the Chinese space agency plans to implement the engine in the satellites as soon as possible. Scientists have been left surprised after tests have shown that the EmDrive –which has no fuel to ehavet— completely shatters Newton’s third law which states that every action has an equal and opposite reaction. IBTimes Uk reports that researchers with Cast –a subsidiary of the Chinese Aerospace Science and Technology Corporation—confirmed at a press conference in Beijing that the Chinese government has been funding research into the ‘EmDrive technology’ since 2010, and that they have already created a device that is currently being tested in space. Li Feng, the Chief designer of Cast’s communication satellite division claims that the team has successfully designed a prototype that generates a few millinewtons of thrust, IBTimes UK reports. However, for the engine to work on satellites, the team will need to ramp up the levels to something around 1 Newton’s. This means that they will have to work on the cavity design in order to reduce electrical losses, developing a solution for the placement of the microwave thruster on the satellite itself. Featured image: Artist’s concept of an interstellar craft equipped with an EM Drive. Credit and Copyright: Mark Rademaker.